The Water Council Leadership Vision & Strategy | Vandewalle & Associates, Inc. The vision and partnerships for The Water Council grew directly out of this M7 World Water Hub opportunity. 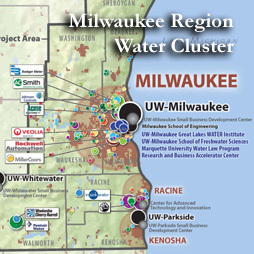 Today the Water Council is headquartered in Milwaukee, serving as a broad-based public/private partnership providing regional leadership to advance water cluster development. The Water Council’s growing national and international network includes more than 180 corporate members and 100s of partners and collaborators. This partnership works to create a more coordinated and integrated water cluster for the region—where large and small regional businesses have opportunities to collaborate with each other, connect with and commercialize research, access the best available workforce talent for their industry, and penetrate global markets to export their products and services.In 2006, Vandewalle and Associates worked with the Milwaukee 7 Regional Economic Development Partnership to lead a landmark Economic Asset and Opportunity Analysis process for the seven counties in the greater Milwaukee region. This work helped shine the light on a number of place-based and globally driven opportunities for the region—including the opportunity to advance a World Water Hub for freshwater technology and education based on the tremendous existing assets. Opened in 2013, the Global Water Center is at the heart of Milwaukee’s new Water Technology District and Global Water Technology Park, Reed Street Yards; this has become the focal point of Milwaukee’s Water Research and Manufacturing Hub which has already spurred $211.6 million in development. Along with The Water Council headquarters, the Global Water Center houses water-related research facilities for universities, existing water technology businesses and accelerator space for new and emerging water-related companies. The facility is a venue for attracting and creating new businesses in the water industry, and aims to address water quality, technology and policy issues locally, regionally and globally. Jobs and Innovation Accelerator Challenge Grant. In 2011, Vandewalle & Associates was the lead author and strategist on the federal Jobs and Innovation Accelerator Challenge Grant, which successfully secured nearly $1 million to advance the accelerator and various workforce initiatives. Leadership Vision and Strategy. In 2013, Vandewalle & Associates worked with the Water Council Board of Directors to prepare a Leadership Vision and Strategy. This was a year-long project to develop a high-level, opportunity-driven plan designed to communicate the next key directions and set forth a vision for The Water Council’s growing and changing opportunities, roles, and responsibilities as the Epicenter of the Global Water Industry and an EPA Grant to make Milwaukee the home to the National Center for Innovation in Small Drinking Water Systems. International Market Assessment and Strategy. Vandewalle & Associates also helped to create an International Market Assessment and Strategy for the Water Council, developing a strategy that sets forth opportunities for Wisconsin water businesses and institutions to move beyond US water needs and demand for products, and address water needs in the global Market where needs for water solutions will be much greater. Innovation Commercialization Exchange: ICE Institute. In 2016, Vandewalle & Associates has assisted and continues to work with The Water Council in conceptualization, strategic planning, and business and operating plan development for a new program which aims to accelerate innovation, commercialization, and exchange of technological water solutions for industry by connecting technology with industry, identifying latent technologies and research within university and federal labs, filtering available technologies to find the most relevant and promising, matching technologies to needs, and accelerating their path to commercialization.